The life expectancies of the richest and poorest people in England are getting further and further apart according to the National Audit Office (NAO). Average life expectancy is now 77.9 years for men and 82 years for women but in poorer areas it falls to 75.8 and 80.4 years. Between 1995-97 and 2006-08, the life expectancy gap grew by 7% for men and 14% for women. 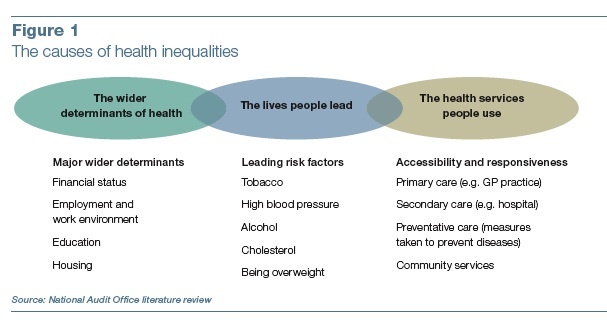 The NAO concludes that 'the Department of Health has made a serious attempt to tackle health inequalities across England' but that a government target to reduce the difference in life expectancy by 10% between 2000 and 2010 is unlikely to be met. Michael Marmot, whose recent report for the government Fair Society, Healthy Lives covered similar ground said he was not surprised by the findings since the persistent inequalities highlighted in his report remain. The MHF has since called for Marmot's report to be implemented. to double the capacity of smoking cessation services.